Log, track and route issues to quickly restore your customers’ service. An incident is an unplanned event that affects the quality of your service. And through Service Desk, you can ensure these interruptions don’t last. 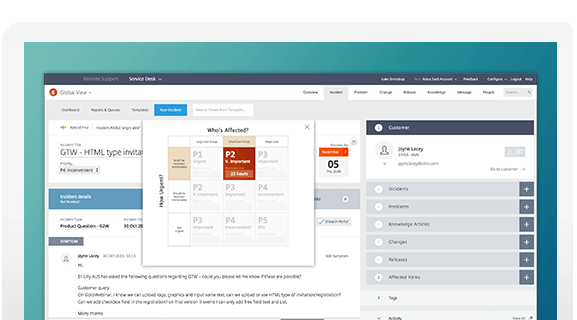 You get a clear view of each ticket’s priority, deadline and progress so you can stay on top of your service level agreements (SLAs) — and get your customer back up and running fast. You can create incident records in seconds that detail which service is affected, who it’s assigned to, what tasks should be done and when it should be resolved. You can also add contextual information and custom fields to capture everything you need to know. 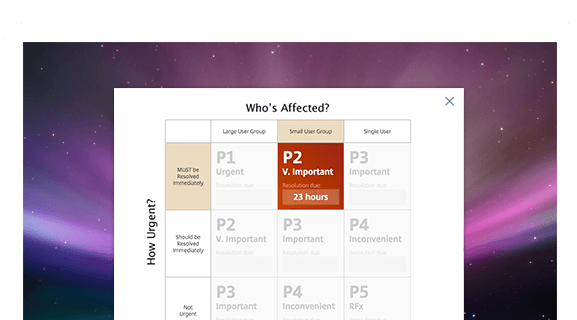 All open incidents show up in your dashboard, where you can see the highest priority issues at a glance. Each Service Desk account comes with a simple online portal where customers can enter their own tickets. You can choose which questions show up on the form, and the information is automatically added to your incident records. Customers can then track the submission and stay in touch with you through the entire resolution process. Start remote support sessions in a click. If you’ve signed up for GoToAssist Remote Support, be sure to take advantage of its integration with GoToAssist Service Desk. Right from your incident record, you can instantly launch a remote support session and invite a customer to join you. And after the session ends, the notes automatically feed back into Service Desk for easy tracking. Identify underlying issues so you know where to focus your efforts.